I was born in Oakland. This simple fact means that I will always have a fascination with the city. It also means that I will always root for good things to come Oakland’s way. I regularly visit Oakland. My favorite thing to do in Oakland is impossible to say because there are so many things I love to do in Oakland. I love to see my daughters laugh and have fun at the Oakland Zoo, for example. I enjoy strolling up and down College Avenue and eating at the Crepevine. It goes without saying that I really enjoy spending time at the Coliseum Complex (be it A’s, Raiders or Warriors games). And Rudy’s Can’t Fail‘s $5 shot and PBR isn’t all that bad either (except the whiskey tastes like gasoline, but what should I expect for $5?). There are other things we agree on, as well. One is that Oakland some times gets short shrift in the local papers. Some times the headlines get a little gratuitous (when was the last time you noticed a positive headline?). We all know that Oakland, being the 46th largest city in the country and like many other medium sized and large cities, has certain neighborhoods with crime problems. That has nothing to do with whether the A’s should continue to play in Oakland, it has little to do with quality of life for the city as a whole and repeatedly pointing it out is tantamount to taking “pot shots” at the city. So, let’s set that aside too. We agree that Oakland sometimes gets pot shots lobbed in its direction and they aren’t always fair. Now can we have an honest discussion about the things we don’t really agree on? Let’s keep in mind that there is a difference between legitimate critiques and having “a bias against Oakland.” There is a difference between asking fair questions and casting aspersions toward the Bright Side of the Bay. In short, pointing out obvious challenges is not that same as leveling baseless attacks at Oakland or its citizens. In the early part of this season I read a letter written/signed by some fans dedicated to keeping the team in Oakland and I had to shake my head. The very first point they made about off the field issues (the East Bay has traditionally supported the team by regularly drawing in excess of 2M fans) was an intellectually dishonest statement and symptomatic of the spin campaign that has been waged by Oakland advocates. This is not to say I don’t appreciate their passion, or that I have a personal hatred for them. Many folks in the pro San Jose camp point to things that happened when Jerry Brown was Mayor, or that didn’t happen when Ron Dellums was Mayor, as evidence of historical failures. I agree with you Oakland boosters that these failures are ancient history and irrelevant to the current state of stadium hunting affairs. However, the “slam dunk” you were all heralding at Victory Court turned out to be vaporware without a single peep about how you had been bamboozled. The grand “plan” of Coliseum City worked to convince the Warriors to leave Oakland (“We’ve met with Mayor Quan on numerous occasions,” Warriors owner Joe Lacob said. “We’ve not gotten any definitive proposals from her.”). Next up is the many times visited, and previously rejected, Howard Terminal. And let me be clear… It is not unfair to point out that Victory Court, once heralded as a viable site, turned out not to be. It isn’t a pot shot at Oakland to point out that Coliseum City (touted as the mega development that would convince the A’s, Raiders and Warriors to stay) is reportedly supported by a single sports franchise, provided the excuse for one to leave and was considered and rejected by the other long ago. It is also not a shot at Oakland to point out that Howard Terminal was the most expensive proposition in 2001 (which means it is still expensive) and has numerous hurdles before it can be built. Pointing these things out doesn’t mean that Howard Terminal couldn’t house an aesthetically pleasing ballpark. Pointing these things out is accepting reality. And really, that’s my biggest gripe with the “Keep the A’s in Oakland” movement, in general. When is the “look in the mirror” moment? When do the people who want to keep the A’s in Oakland stop with the PR and start with the doing? Where is the outrage and indignation towards the Oakland City Leaders over the whole kabuki theater around an EIR for Victory Court that never happened? How does whole group of people get so invested in a potential site and then not even make a peep when it comes home to roost that the site was as unrealistic as many critics pointed out? When do the Oakland proponents start pushing the City to begin an EIR for Howard Terminal? When do folks start to actually question if Howard Terminal isn’t just another Victory Court? Why is it the City leaders get a free pass? Let’s get real. When folks point out that there are many more corporate/business customers available in Santa Clara County, in San Jose or within 21 miles of the proposed Cisco Fields site… Those aren’t attacks at Oakland. Cisco pledged $120M over 30 Years for a Ballpark in Fremont. Are we really supposed to believe they wouldn’t offer something similar in the heart of their base of operation? No company has made a similar proposal publicly for a stadium in Oakland. Are we just supposed to believe that there is some mythical company that has this covered? 75 CEO’s signed a letter of support for the A’s potential move South and sent it to Bud Selig. Those 75 CEOs were writing on behalf of an organization that represents $3 Trillion to the world’s economy. Conversely, Don Knauss had 11 other companies (some of which are huge and some which haven’t turned a profit) with him at his press conference. It isn’t just a matter of perception. The business customers in San Jose are far more plentiful than in Oakland. Ditto the South Bay as compared to the East Bay. Combine this difference in corporate sponsorship opportunities, with the paltry attendance numbers and there are legitimate concerns about privately financing a stadium. That isn’t an attack on Oakland. It is a legitimate concern. There has been one fully, privately financed stadium built in MLB since the influx of stadiums began in the 1990’s: AT&T Park. 48% of that private financing depended on advanced ticket purchases and naming rights. To get more granular, 20% of AT&T Park was financed by PSL’s and 28% was financed by a lucrative naming rights deal. Another ~48% was provided in the form of a loan by Chase Bank. What I am saying is that if you want to get something done, you need to address the actual challenges, not fight perception. Making statements about how great attendance has always been, in the face of evidence to the contrary, won’t get a stadium built. Getting commitments from guys like me, or the 51,000 folks on the LGO Facebook group, to buy season tickets for a brand new Oakland ballpark will. Arguing with folks that Cisco won’t sponsor a stadium in San Jose, when we all know they will, won’t get a new stadium built in Oakland. Getting Chevron, or Clorox, or some other very large company to agree to a naming rights deal that pays $4M a year over 30 years (and having them shout it out publicly) will. These things won’t get you all the way there, Oakland proponents. But they can get you 48% of the way to paying for it and that’s a whole lot closer than you have come to date. My thanks to Marine Layer for lending me his space to expand on my post over at Athletics Nation. I didn’t expect it to get this long, but as I dove into the subject, I found it more fascinating. I hope you find something interesting as well. The A’s lease at the Coliseum runs out after the 2013 season. If they are unable to come to an agreement with the Coliseum Authority on an extension, or for some other reason are unable to play their home games at the Coliseum, what would they do? Where would they play? For the sake of discussion, let’s assume that as a result of not having a home after 2013, the A’s and any municipality you desire have come to an agreement to move forward with construction of a new baseball-only stadium. It doesn’t matter where it is, only that it will not be completed until Opening Day 2016. This leaves 2014 and 2015 up in the air. To help guide us in the right direction, there are a few goals we’d like to meet. We don’t have to hit all of them exactly, but how close we come to meeting or exceeding them determines the level of promise of the plan. MLB would like to keep the A’s nearby or in the Bay Area, to keep the local fan base participating. One million in attendance is deemed sufficient for the seasons spent wandering, but one and a half million is better. There are eighty-one home dates to be determined. Temporary construction only, unless it is reasonable to expect permanent additions to be accepted by the landlord. I expect that a solution will involve concessions from a few parties. Other teams will be asked to help the A’s in this predicament, and by extension, MLB. They would probably receive some sort of compensation, but would agree because it helps the entire league. Before we can start looking, let’s define a required capacity range. Oakland Coliseum holds 35,067 at capacity. This year’s average is 21k a game so far, and the past few years have been around 17-20k. To get one million fans through the gates in 81 games, you need about 12k per game. (Actually, 12,345 per game. 1-2-3-4-5? That’s the kind of thing an idiot would have on his luggage!) For one and a half million, you need about 18.5K per game. I think if the A’s could pull in 18.5k per game in this situation, they’d be ecstatic. The best target stadium should have something around 20k seats, to take advantage of the larger draw for the big games and help pull up the total attendance and balance out the lower attendance games. Even though 20k is our target, we’ll still look at stadiums that can hold or be made to hold at least 12k, in the case that the A’s are ‘at home’ abroad. We should eliminate some of the low hanging fruit. The largest of the college ball fields in the Bay Area, Stanford’s Klein Field at Sunken Diamond, can only hold 4k people.The rest of the collegiate baseball parks in the Bay Area are no larger than 2k. Looking at the aerials for Klein Field, I estimate about 3k in stadium seats with the rest being standing room or lawn seating. I just don’t see any way to add enough seats in temporary seating, so scratch that. The other big park, Cal Berkley’s Evans Diamond only holds 2500. Minor league ballparks are usually one of the first places people mention as a temporary home. The only minor league ballpark in the Bay Area is San Jose Municipal, where the Single-A San Jose Giants and the San Jose State Spartans play. It holds 4.2k and could add temporary seating in the outfield at the cost of some parking, the scoreboard and lighting fixtures. There is probably enough room for about 4k bleachers. I estimate that there is enough parking, if you consider the parking lot on-site, the track across the street that is usually used for parking and the parking at Spartan Stadium a block over. Traffic might not be too much of a nightmare, since 880, 101 and 87 are all nearby, and in different directions. The room is there, but the work required to add the temporary seating wouldn’t be worth it unless the team was playing there for a majority of their home games. One advantage they might have is that the stadium is owned by the City of San Jose, and I expect they would enjoy hosting the A’s, maybe even bend over backward to make it happen. The problem is that you are still in the Bay Area with the potential to draw way more than 8k fans a game. This wouldn’t be a choice high on the list. Outside of the Bay Area, we have another Single-A stadium, Banner Island Ballpark in Stockton, home of the A’s Single-A affiliate Ports. It can hold 5.3k fans. I don’t think it could add more than 1k temporary seating on the grass, which still leaves us short. John Thurman Field in Modesto, home of the Single-A Modesto Nuts, holds 4k. Even if they could add at least 4k more seats, I don’t see how the parking problem is solved in that neighborhood. None of these local 8k possibilities are adequate for anything other than a series or two against teams with a low draw, and likely only if there was absolutely no other place to play. Probably the most mentioned ballpark to host the A’s is Raley Field in West Sacramento, where the A’s Triple-A affiliate River Cats play. (Usually talk revolves around adding a second deck, but that’s impossible without a rebuild, and even if it were possible to just add on, it is out of bounds of our thought experiment.) It can currently hold 14k fans. That fact alone makes it start to look much better than any of the others we’ve looked at. Sacramento is a location that already has a decent A’s following, due to the relationship they have with the River Cats team (and the fact that many of the players wear both uniforms over the span of the season). It’s close enough that it allows existing fans in the Bay Area to go see games, even if it’s not the most convenient. As far as raising the number of seats, we have to actually take a step back. The capacity is 11k if you count only the fixed seats. The rest was lawn and standing room. Temporary seating is only possible in those lawn areas, and based on the size, you couldn’t add much more than you are taking away. We could probably conclude it’s not worth the effort, and the original capacity stands. While not a solution for every home game, Raley Field would likely be good for a couple weekday series or homestands scattered throughout the year. From here we move to stadiums that are not as easily reached by the home fanbase, but are still within the A’s broadcast territory: Cashman Field in Las Vegas, Aces Ballpark in Reno, and Chukchansi Park in Fresno. Cashman Field, home of the Triple-A Las Vegas 51’s, was previously a temporary home of the A’s in 1996 while the Coliseum was having the Raiders modifications done. It can hold 12.5k people if you include the berms and standing room, 9k counting just fixed. The outfield looks like it could manage some temporary seating, maybe 2k, bringing up the capacity to nearly 15k. We could consider that fans of both teams will fly out to piggy back baseball with their usual Vegas trip. The effect on parking could be mitigated with shuttles stops along the strip. While an argument against a permanent MLB club in Las Vegas is that there is not enough existing population, nor enough tourists to keep a club in business, I think the novelty could sustain it for a couple years as a second or third home. Aces Ballpark, where the Reno Aces play, holds 9k fans, which includes 2.6k general admission. It sits along the Truckee river in downtown Reno. There is lawn in the outfield, but like Raley Field, probably isn’t worth converting into temporary fixed seating. Downtown Fresno has Chukchansi Park, where the Giants’ Triple-A affiliate Grizzlies play. It can hold 12.5k at capacity, with about 2.5k additional standing room. There is room in the outfield for a few hundred temporary seats, but what I find interesting is the concourse along the third base outfield line. It’s flat, unlike the outfields of the previous stadiums we’ve looked at, which should make for easier installation and removal of seating. However, it’s still probably only an additional 1k seats, and would kill some of that standing room. I would probably rate Chukchansi as right below Raley Field if we’re looking for a baseball stadium to host a couple series. I wanted to quickly mention another possibility, and that is the Spring Training facilities in Arizona. Phoenix Municipal, where the A’s currently play their March games, only holds 9k. The rest of the Spring Training field capacities range up to Camelback Ranch‘s 13k. The question is whether there is enough of a local following for the A’s and their opponents to cancel out the concern the Diamondbacks would have for the territorial invasion. I would guess there is probably not enough of a following to keep up attendance for more than a series or two. Still, it’s something to keep in mind should there be a real problem booking time in other locations. None of these solutions are getting us close to the 20k target fan capacity. Another problem with picking a baseball stadium is that it is already being used by a team to play games. Two different leagues with their own separate schedule patterns might be a difficult thing to manage for anything longer than a couple series. So what about rooming with another team in the same baseball league? That’s right, our neighbor across the Bay. That’s OK. I’ll wait. No, I don’t have a bucket. Ready? Oh, you still have a little spittle there… no right there. You got it. AT&T Park is a perfectly acceptable park to host major league baseball, because that’s the reason it was built. Some would say it’s more than acceptable, but we won’t get into those details. For our purposes we’ll just consider it sufficient. It’s in the Bay Area so the existing fanbase has easy access. It can hold nearly 42k, not counting standing room. The main problem is that the Giants have their own game schedule, but a quick investigation shows it might not be much of a problem. On only a handful of dates each year are the two teams playing at home at the same time. The other problem is that there are only two locker rooms: one home, one away. Some kind of temporary locker room could be created, either within the bowels of the stadium by reallocating an existing room or by some portable structure on the outside. Another option is the magic of the equipment managers swapping everything when the homestands change. Is there another problem? Oh yea, the Giants might not be particularly impressed with this idea. So what do we do? Let’s look at football stadiums. The first one we should consider is Candlestick because it was built as a baseball stadium which later had football modifications. It’s last listed capacity for baseball is 58k. Since the Giants moved out, the retractable seating in right field stays in the football configuration all the time. I don’t know the last time they moved them back. It could be ten years or more. Does the mechanism still work? If the seating can be moved back into baseball configuration, then Candlestick could work really well. It won’t be as pretty or as fully featured in the off-the-field aspect, but it wouldn’t have any scheduling conflicts with another baseball team. The 49ers might complain a little, but I’m sure they could get some compensation for their troubles. The Giants may not like the idea either, as it would mean another MLB team is playing deep within their territory. 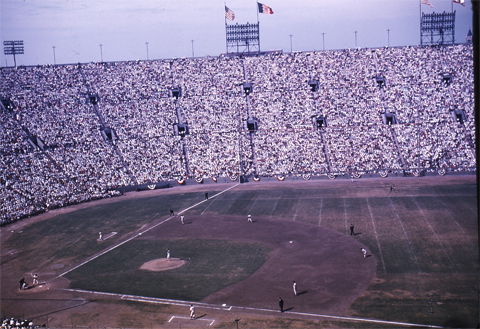 LA Memorial Coliseum during game four of the 1959 World Series. Baseball in genuine football stadiums has been going on for a long time. (There is a joke here that the A’s have been playing in a football stadium for at least 16 years, right?) When the Dodgers came out west in 1958, they played four seasons in Los Angeles Memorial Coliseum while Dodger Stadium was under construction. The left field wall was a mere 251ft away! Commissioner Ford C. Frick ordered a wire screen be installed to stop simple pop flies from becoming home runs. The Dodgers put in a screen that went 42ft high. (For a comparison, Fenway Park’s Green Monster in left is 310ft away, and just over 37ft tall.) Frick wanted a second screen installed in the stands to again reduce the number of home runs. Balls that fell short of the second screen would be ground-rule doubles. However, California earthquake laws wouldn’t allow the second screen to be built. Not wanting to deal with this again elsewhere, the leagues passed a rule that new ballparks must be at least 325ft down the lines. So could we consider Stanford Stadium (50k) and California Memorial Stadium (63k), or most any other football stadium in the Bay Area with enough seating? I did a little Photoshop investigation and discovered that there would be even less distance along the left field line than there was at Los Angeles Memorial Coliseum. All three would be just about 210ft if you pushed the first base line almost up to the wall, which is not even legal for an MLB park as they want 60ft or more from home to dugout. Even if it were, it would would still need one really tall screen. Only 160ft width is required for a football field and stadiums like to bring the fan close to the action so there isn’t much leeway on the sides in those stadiums. We’d have to find one with a multi-use field footprint or at least one with a wider, rounded interior. Or is there something else that is wider, you say? How about a soccer stadium? Comparing the left field line distances and fence heights. FIFA recommends pitch dimensions of 105m by 68m, or translated into feet, about 344ft long and 223ft wide. (PDF, see chapter 4) They allow other sizes, but World Cup matches require the recommended size. 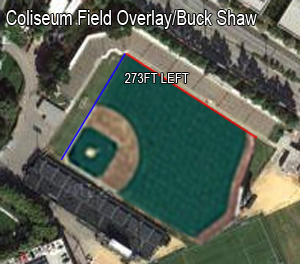 They also prefer about 28ft on either side, putting the total width available at 279ft If we can find a stadium that fits this bill, we may be able to squeeze a baseball field onto it. Planned for construction a few blocks away near San Jose International Airport, New Earthquakes Stadium will hold 18k people and replace Buck Shaw as the home of the San Jose Earthquakes. I wasn’t able to find a confirmation on the pitch size, but it is reasonable to expect it to comply with what FIFA recommends. We know the relationship that the A’s and Earthquakes have with common ownership, but the best part? It’s scheduled to be open in 2014, should all go as planned, and that means the A’s could move directly from the Coliseum and use it as their main home for the next two years. It would fall 46ft short of MLB’s minimum distance, so would they waive the 325ft requirement in this situation? Would a screen about 40 feet high and 50+ years of advanced screen hanging technology help? And would Earthquake fans be displeased with this turn of events after waiting so long for their own place? Would the NIMBYs allow it? Lots of questions, but it is near 880, 101 and 87, with plenty of parking. Rendering of the new Earthquakes stadium. Since it’s in the Bay Area, we can expect that baseball games there could easily draw more than 18k. Is there a way we can get the capacity up? The most obvious location is on the open end. The grass planned there could instead be built with fixed seating and the scoreboard repositioned higher or pushed further back. It might be possible to up the capacity by 2k, and even add some temporary suites for additional revenue. With the overhang built over the stands it should be easy to suspend the required screen at any height MLB wanted. Making design changes to a facility that has yet to be built is much easier than shoehorning in temporary seating to an existing park, but there are still limitations to what can be modified and you don’t want to make them too permanent, as I’m sure they would want to revert back to the original design. One caveat about playing in San Jose relates to the Expos. They were the last team to play home games outside of their regular park when they were auditioning San Juan for a potential permanent move. In 2003 and 2004 they played 22 game at Hiram Bithorn Stadium in San Juan, Puerto Rico. It has a capacity of 18k and they only averaged 14k per game. While that is still 2k more than they were averaging in Montreal, it proved to MLB that the demand just wasn’t there on the island and killed any chance they had of earning the team. I think the chance of San Jose attendance faltering like this low, however it’s still something to be concerned with, and really could be an issue anywhere they play in the Bay Area. MLB is going to want to see sellouts often with such a low target capacity considering permanent major league stadiums hold at least 37k. I think by this point we’ve run the gamut of stadia. It’s easy to dismiss most of them as not practical. While it would be fun to imagine a road trip where the A’s play in some interesting parks out of the Bay Area, there just isn’t enough seating to declare them more than “in case of emergency, break glass” locations. The larger stadiums have the most promise as long term temporary homes, and the most potential for revenue. I’m not sure how accepting the Giants would be of sharing their park or even allowing the A’s to play at Candlestick or the South Bay options, since they are technically in their territory. If, however, the territorial rights problem had been resolved in the A’s favor and they were granted San Jose, I could see MLB making cohabitation of AT&T part of the compensation package. Not only would the Giants receive some number of dollars, they would also have up to 78 extra events to sell where they could split the gates with the A’s but take all the concession revenue for themselves. If they really don’t like the idea, MLB could attempt to force them to be OK with Candlestick or the new Earthquakes stadium. None of these solutions would have to be one location only. Raley Field, Cashman or Chukchansi could handle a series or two if there were scheduling conflicts, and become a neat special event. I’m not sure which idea I like the best for the A’s main temporary home out of AT&T Park, Candlestick Park or New Earthquakes Stadium. AT&T would draw a great crowd and is easy to get to, but the other two would put less money in the Giants pockets. Candlestick would be cold and harder to travel to, though easy to schedule. 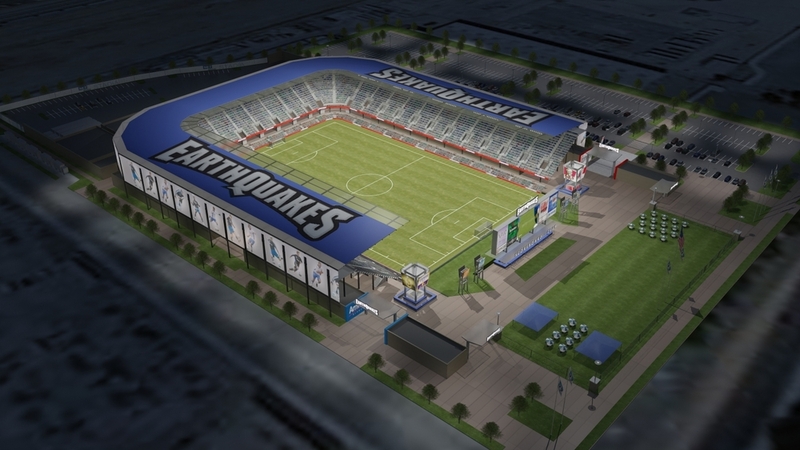 New Earthquakes Stadium could be an awesome way to jumpstart the SJ fanbase. The A’s showed up. How about you? Here the green-and-gold heroes sit, winners of 9 of the last 10, only 1/2 game from the last playoff spot in the American League. It’s all very impressive for any number of reasons: young pitching, young sluggers becoming professional hitters, nearly every move made by the A’s front office paying off so far. Despite this, there’s a little hesitance going into this week’s six-game homestand, with two games against the West-leading Rangers and four against the East-frontrunning Yankees. The Yankees series is always good for near-sellouts every game, and the Rangers bandwagon has been filling the Coliseum pretty well lately. But who cares about the other team’s fans? We should be filling up the stadium. Tuesday night’s game is, as usual, a free parking night. The A’s deserve a heroes’ welcome. The pitching is excellent even with Brandon McCarthy out. Numerous guys are hitting homers like it’s batting practice. The team has budding stars who are all young and under control, and the team is flat out fun to watch with no big money egos to ruin a fan’s enjoyment. We should have 20,000 fans showing up on Tuesday. I fear we won’t come close. There will be people who cite their dislike of Lew Wolff, John Fisher, Billy Beane, or whatever’s convenient to not go. They’ll claim they were the biggest A’s fans during the Moneyball years, the Haas era, during BillyBall, or all the way back to Charlie Finley. Stop with the excuses, put your differences with ownership aside, and go to the games. The tickets are inexpensive. There’s no better weather to watch baseball than at the Coliseum in July/August. The team is pretty damned entertaining. Most importantly, this scrappy group of A’s consistently of mostly young guys and a mix of veterans notices when we show up. En masse. They don’t play in a vacuum, and as much as they appreciate the small-but-loyal crowd that shows up currently, they appreciate it even more when the place is packed. With A’s fans. All of the experts and columnists had this team buried in March. Personally, my expectations were low. This team deserves for us to buy tickets, supporting them, cheering them on with full voices, all of our energy, every breath. Whether the A’s are buyers or sellers or both doesn’t matter. We have a core to build on for years, and they’re not going anywhere for a while. That’s what matters. So enjoy it. The A’s showed up this year. How about you? Off the soapbox. The maximum possible attendance for this week is a little over 210,000. It would be unrealistic to predict that they’ll hit that target. But they could pull healthy crowds for the entire week. If the A’s average 22,000 for Texas and 32,000 for the Yankees, the total attendance for the homestand will be 172,000. Should they hit that mark, the team’s attendance in Oakland (not counting the Japan games) will surpass 1 million fans in 48 home dates. That’s five games ahead of last year’s pace and seven better than 2010. Can we hit that figure? I think we can. I’ll be there for the first three games of the homestand, before going on a weekend camping trip. Let’s do this. I didn’t get season tickets this year. I waffled about the decision all the way through April. In the end I chose not to get a package this year, forgoing the savings a package can provide. I’ve been fortunate to have a few friends who provided freebies on occasion. Most of the time, I’ve simply walked up to get tickets. Years ago, before the advent of the internet and the mobile power that comes with smartphones, the A’s had freestanding booths for day-of-game tickets. The booths were located outside all of the main gates. Agents manning the booths were furnished with stacks of preprinted tickets, with different quantities for certain sections or price levels. The booths went away around the time the Wolff/Fisher group took control of the team. For years, fans choosing to get day-of-game tickets just before the game had no choice but to buy from the permanent booths on the BART plaza and near gates C and D. This year, the booths have been supplemented with electronic kiosks, which, like the booths, charged no fees on any tickets sold (including advance tickets). This has helped alleviate some of the frequently long lines, along with providing multiple places to pick up will-call tickets. Tonight I noticed something odd about the system. Every Red Sox game is a “premium” game, with slightly higher ticket prices compared to games against most other teams. The A’s charge higher prices knowing that demand is expected to be greater, though I’ve noticed that demand for Red Sox games has gone down precipitously in the last few years (Monday night’s attendance: 17,434). I kept track of what tickets online seller tickets.com had available through the website. By the early afternoon, I noticed that no Value Deck seats were available. There’s nothing special about the demand for Value Deck seats except when a group buys a large block of them (only 1,000 are available per game). I figured that because of the missing Value Deck tickets, demand was reasonably high. Running counter to that assertion was the fact that the team was also selling “Dynamic Deal” tickets, at $22 for Plaza Level and $10 for Plaza Outfield. The crowd during the bottom of the 2nd. I got one of the $10 seats, got some food, and sat in my seat at 7 on the dot. The bleachers were about half-full. So were many other sections. I thought that perhaps there might be a late-arriving crowd, but I was wrong. Based on the way the sections were filled, the place looked half full. 17,434 paid attendance seems to confirm that, though there were probably 2-3,000 no-shows as well. I looked up at the Value Deck repeatedly and noticed that those sections were also at best half full. Yet the advance tickets were sold out. So what gives? I can’t come up with an explanation for what happened, and as a single data point it would be foolish to draw any specific conclusions from it. The A’s don’t have anything to gain from manipulating the availability of any ticket type, simply because the demand is so elastic that the gains would be worth peanuts. The observation has certainly made me want to pay more attention in the future to inventory and availability compared to the in-house optics. Next opportunity is Wednesday’s series-ender against the Sawx. I put out a couple of questions on Twitter, and I figured I should have the conversation here as well. The #Athletics have traditionally had Opening Night – not Day – games. What do you think about having a day opener instead? The way the schedule is currently formatted, with the season starting on Wed-Fri and ending on Wed, it’s practically impossible to schedule a Sunday opener. This format is fairly new, so if MLB were to go back to starting on Sun-Tue and ending on Sun, there might be an opportunity for a day opener. Cincinnati used to always have the first game of the season, sometimes on a Sunday, almost always a day game before everyone else as a nod to Cincy being the most senior of senior league franchises. Lone Stranger replied to my second question, saying, “Anything earlier than 6pm or so would need to be near people who can leave work early and still see first pitch. i.e. Downtown.” Other responses to the two questions were mixed, some citing favorable weather for day games, others wanting a night game as a better chance for a sellout. FWIW, The Giants have done day openers going back to their days at the ‘Stick.